As the size of a wheel increases, the height of the sidewall decreases, providing a sportier appearance and better handling. This presents a problem for car care enthusiasts – properly cleaning low-profile tires without damaging your expensive wheel! 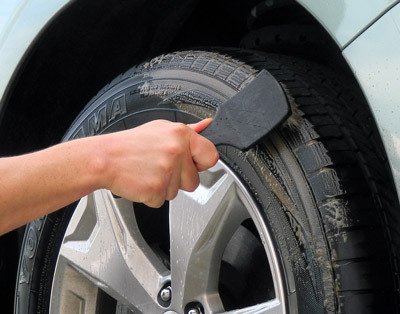 The Low Profile Tire Brush and its slim, ergonomic design is the perfect size for cleaning low-profile tires. The secret to obtaining maximum durability from a tire gel is properly cleaning the tires first. If you apply a tire gel to a tire that hasn’t been cleaned, the shine will only last a couple days at best. Deep cleaning your tires, ridding them of dirt, grime, road film, and previously applied gels and protectants will dramatically increase the durability of your tire protectant of choice. That’s where the Low Profile Tire Brush excels! Pair the Low Profile Tire Brush with Wolfgang Tire & Wheel Cleaner to get your tires cleaner than they ever have been. Brushes that I have tried have been too soft or too stiff. The bristle rigidity of this brush meets my personal preference. I knew the first time I used it that I had made the right decision. I really like this brush does the job! ProsStiff bristles do really good job! Excellent purchase. Great brush for scrubbing low-profile tires. Its a brush and it works. I mean, it's either gunna work or not. I like this tire brush a lot for low profile tires. Many tire brushes are just too big for sportier cars today. I definitely like it, but for five stars it needs to go above and beyond; maybe a rubber coated handle?